SciTech » What happens when science fiction crosses into science fact? What happens when science fiction crosses into science fact? Cloaking devices are the stuff of magic realms and deep-space exploration, not real life. Think again! Making photonic chips invisible to one another could pave the way to computing at the speed of light. Researchers at the University of Utah have developed a cloaking device for truly tiny photonic integrated devices — the building blocks of photonic computer chips that run on light instead of electrical current. While that still sounds fairly fantastical and fanciful, it’s a huge breakthrough for the computer industry, data centres and mobile device-makers, not to mention the environment. It paves the way for efficient photonic chips which shuttle data around as light photons instead of electrons. This breakthrough in nano–photonic cloaking, making neighbouring devices invisible to one another, was published in the latest edition of the science journal, Nature Communications. Photonic chips will wind up being much faster, consume less power and give off less heat than today’s silicon-based chips. Think of the possibilities for foresighted entrepreneurs. 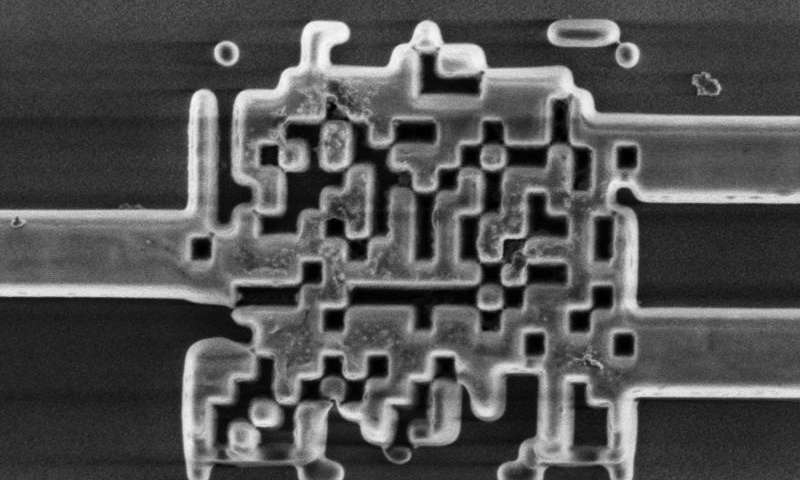 Potentially billions of photonic devices could be stuffed inside a chip, each with a specific function in much the same way as transistors work in today’s microchips. One set of devices could perform powerful calculations or programmed simulations while another group processes requests and others maintain everyday functions and updates. But light is no-one’s slave and cramming so many of these microscopic photonic devices too close together causes leakage. When light leaks the resulting back-chat or cross-talk acts like radio interference. Not good. Spacing them further apart solves the problem, but this makes the chips too large, especially for mobile devices. The lab guys worked out that using a special nano–patterned, silicon-based coating between photonic devices acts like a “cloak”. One of the obvious benefits of chips using light photons instead of electrons to transfer data is the energy savings, anywhere from 10 to 100 times less power consumed, according to the Utah team. Data centres like Google and Facebook will no doubt like the sound of this, but the afterglow of nano-sized photonic devices could light up a range of sectors, from app-makers to serious games to green tech. In the United States alone, data centres consume around 70 billion kilowatt hours (2014 figures), which is some 1.8% of total electricity consumption, according to research by the US Department of Energy’s Lawrence Berkeley National Laboratory. With the growth in cloud computing and other rapid IT developments, that power usage is expected to rise another 4% by 2020. “By going from electronics to photonics we can make computers much more efficient and ultimately make a big impact on carbon emissions and energy usage for all kinds of things,” concludes Menon.